Here is a super fun idea I would love to take credit for. But actually, my little sister had the idea to try rub-ons on candles. They work amazingly. My tip is just to start at one end and go all the way to the other. Don't start in the middle and work out because it's a little tricky to hold the rub-on onto the candle since it has to curve. If you start on one end, you only have to hold down that part until you see the color change letting you know it's adhered to the candle. Just a note. We also tried rubbing them onto our little pumpkins. Rub-ons don't like to stick to pumpkins! So, don't waste your time or your rub-ons with that. We have plans to try painting the pumpkins or coating with a clear coat and seeing if that works. We also have plans to try rubbing them onto glasses for a Halloween party. Before I decorate all my glasses though, I want to make sure they will eventually wash off! Ooohhh these are CUTE!! I'll hafta get me some candles now!! Thanks for the tip amyr! I thought the rub-ons would be fun in a party setting and help people remember which drink was theirs. i wonder if Undo would get them off the glasses?? Hmmm... Any report on how the candles burn with rub-ons? Do they catch fire or melt? I suppose it's just smart to put in a tea light though. These look fantastic! What a great idea. Very cute! Thanks for sharing. Let me know if the rub-ons work for glass (if they clean off, too). Very cute, I have always wondered if that would work or if it would go onto pumpkins, thanks for trying it out! Cool! What a great idea! I love the ribbon too! Yes, rub-ons work on glass or plastic. If they don't wash off you can always use undo adhesive remover on glass, but skip it on plastic since it may scratch the surface. Might need to go back and do more with rub-ons! oh super cute!!!!!! I'm thinking I have an idea for Christmas gifts now! Yep...I'm all over that! Thanks for all the great ideas! I've used rub ons on metal before. Get the cheap metal buckets from the dollar store and slap some rub on's on there...make great gifts! I love the candle and glass idea! What about the artificial pumpkins and gourds? I have one right here-will try it out and let you know! 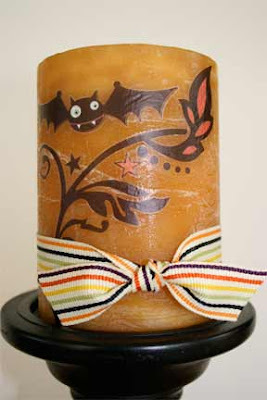 I did some candles yesterday and was wondering if rub-ons would work-now I can decorate some more. 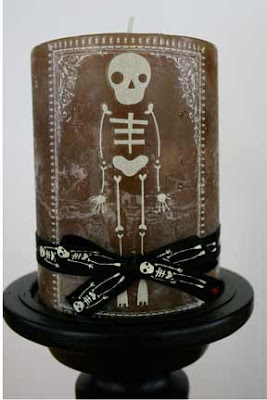 That skelly candle is the best thing Ive seen in a LONG time. I looove him. I love the candles, they can be a great tools if you want to conquer a boy. I prefer to use a candles with some fragance. I think the men love it too.